The New York Times today tells a harrowing story about the Islamic system of dhimmitude forced onto Christians in Iraq under the very noses of American forces--but it's clear the newspaper doesn't realize it. The subject at hand is a Sunni-insurgent version of the "jizya," or Islamic poll tax, which, since the days of Mohammed, has been collected from Jews and Christians according to Islamic law as payment for thepermission to worship non-Islamically. 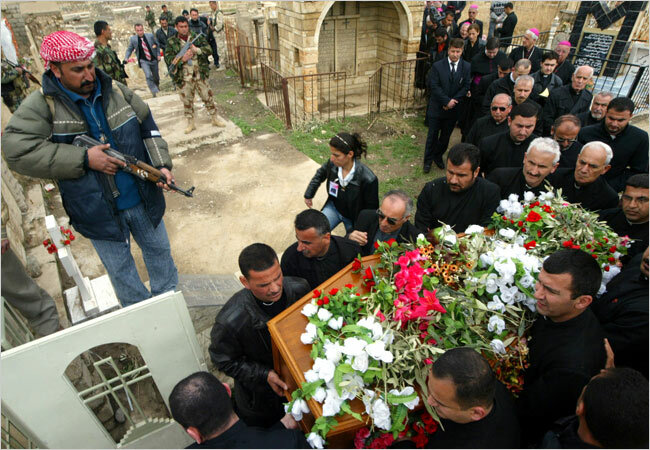 According to a Christian member of the Iraqi parliament quoted in the story, "All Iraqi Christians paid." MOSUL, Iraq--As priests do everywhere, Archbishop Paulos Faraj Rahho, the leader of the Chaldean Catholics in this ancient city, gathered alms at Sunday Mass. But for years the money, a crumpled pile of multicolored Iraqi dinars, went into an envelope and then into the hand of a man who had threatened to kill him and his entire congregation. "Cloak"? If, as the reporter has written, the insurgents chose to "cloak" their extortion with the word "jizya," then the reporter has implied that jizya is NOT extortion. The subtext thus leaves us assuming that the insurgents are somehow twisting a high-minded religious institution to cover nefarious, gangland ends. But jizya by definition IS extortion--a centuries-old Islamic tool of torment and terror tand humiliation hat you might say the Mafia only much more recently expropriated. Um, where was the US of A? Christians, seen as allied with the American invaders, became targets of retributive attacks. “Leave or die” notes began appearing on their doorsteps. So, if true, Iraqi infidels, already seen as allied with American infidels and, thus, targets of attacks, went unprotected by American infidels so American infidels could deny a propaganda victory to Iraqi jihadis. So ugly if true. The Times account goes on to place the deployment of less effective Kurdish, and not US, forces in these areas into this context. Tragically, such a desire to placate Islamic sensibilities--including those directly at odds with our own core values--is something the US has long been in thrall to. Just consider the fact that only out of concern for Islamic sensibilities, the ally that would be of greatest service to US efforts in the region--going back decades--is shut out of every darn worldwide coalition of the willing we try to form: Israel. "Well, of course," most politicians would say. "If we militarily align ourselves with Israel--its very existence an afront to Islam--and if we saved Christians from Islamic law--another afront to Islam--the Islamic world would think we stood for liberty and justice for all...and we wouldn't want that, would we???" UPDATE: Andrew Bostom, author of the recently released The Legacy of Islamic Antisemitism, adds scholarly heft here.